More binoculars have been ruined by improper cleaning than by being dropped. You've seen someone do it. Breathe on the binocular's eyepiece and then rub the glass with the corner of a shirt. Poor birder, he never knew he just degraded every image he would ever see with that binocular again. The breathe-and-rub method is really way to frost the glass—like a glass shower door. A primary ingredient of dust is silica — in other words, tiny rocks. Silica is harder than glass. If you rub dust across your eyepiece, you gouge microscopic scratches into the glass and the ultra-thin coatings on lenses. You can't see the scratches individually, because they're so small, but they scatter light. And so over time your binocular begins to give a cloudy image. 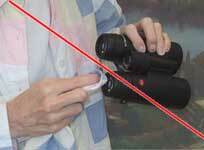 It's easy to clean your binocular the right way. Remove all the loose dust from the binocular's lenses. Or blow with a can of air (from photo store). Don't use your breath — the air coming out of your lungs has tiny droplets of water in it. They will spot your lens. Moisten a Q-tip with water or lens cleaning solution and float off any remaining dust. Or, if your binocular is waterproof, you can actually run it under the tap (but don't squirt it hard). Do not use fluid designed for cleaning eyeglasses or windows, as it may attack the coatings. Now that the dust is gone, you can wipe the lens with lens tissue, a special micro fiber lens cloth, or a very soft cotton cloth (like a piece of a clean old cotton undershirt). Do not use paper towels or facial tissue, as these are too rough. They often include wood fiber that will scratch your lenses or the coatings on the lenses. 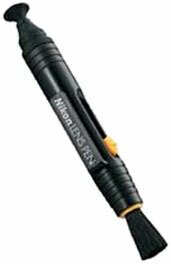 Please call us toll free 800-779-7256 for advice on choosing scopes or other birding products.